Live in the sunshine, swim in the sea, drink wild air.” That famous quote seems to sum up all the fun we expect from the summer months, but is our skin ready for bare-skin season? Did we switch up our skincare regime when the weather changed? If you didn’t, don’t worry! Here is our guide to prepping your skin for summer and the local experts who can help you. “Aside from the obvious health concerns related to too much sun, sun is also aging,” Dr. Mai says. “Having adequate protection is paramount in preventing the signs of aging. Gone, however, are the days of thick, oily white sunscreens. They have really evolved. There are now tinted, cosmetically elegant options that actually feel and look good on the skin. Dr. Mai’s favorite sun protection products include: Total Defense + Repair Broad Spectrum Sunscreen by SkinMedica (available in SPF 34, SPF 34 Tinted and SPF 50+) and Intellishade by Revision. Dr. Stephen Metzinger, of Aesthetic Surgical Associates recommends sun protection from the European brand, ISDIN. The Flavo-C Ultraglican Ampoules are an all-in-one skin booster with Vitamin C and Ultraglycans to help reduce the appearance of micro wrinkles and boost natural moisture production. Users report brighter and more hydrated skin and a reduction in wrinkles and expression lines. Another product that Dr. Metzinger suggests his patients try is ISDIN’s Eryfotona Actinica. This powerful, broad-spectrum sunscreen has been shown to “decrease the risk of skin cancer.” It contains DNA Repairsones to boost the skin’s natural recovery process, and Vitamin E as an antioxidant to help protect against environmental damage. These cutting-edge ingredients are expertly formulated in an ultra light emulsion that spreads easily, absorbs quickly and leaves no greasy residue, so you can wear it every day. The second part of a good summer skin plan is evaluating your use of retinoids and getting your skin out of winter hibernation. “Retinoids are the gold standard in topical skin rejuvenation,” Dr. Mai says. “These products turn over dull, uneven and damaged skin, allowing brighter, healthier skin to come to the surface. “This exfoliation is what most patients need after a cold, dry winter but in the summer, this may not be feasible, as these products are associated with increased sensitivity to the sun. At Aesthetics Surgical Associates, Dr. Stephen Metzinger uses the ‘SkinPen’ for micro needling. “The SkinPen stimulates two proteins, collagen and elastin, which are the building blocks of the skin and are responsible for skin structure and healing,” he says. The epidermis and dermis layers of the skin are therefore tightened to give a glowing and lifted appearance. Dr. Mai believes that pretty, plump lips in the summer can help create that bare skin look. “Lip filler injections are accomplished by injecting synthetic hyaluronic acid, a gel-like substance of cross-linked sugar molecules naturally found in our skin. “We can do a variety of things with filler – plump, hydrate or improve the symmetry of the lips,” she says. “Best of all, it is instant and immediately gratifying. Lip fillers have a bad reputation in the media but I love showing patients that a well-done lip can actually look very natural and enhance instead of distract”. Dr. Mai also tells patients about SkinMedica’s HA5 lip plump applicator that uses the same material that injectable fillers are made of, but in the form of a lip-gloss. This gloss is proven to make lips appear instantly smoother, hydrated and plumper. If swimsuit season gives you cellulite scares, you could consider the ThermiSmooth Body procedure, also available at Khoobehi. It is non-invasive and uses an external applicator to apply radiofrequency energy to the skin. This heats the skin to the ideal temperature to stimulate collagen and elastin, components necessary for smoother, firmer skin. CoolSculpting is another relatively pain-free procedure with little downtime available at Audubon Dermatology and Southern Aesthetics, as well as at other practices. Drs. Lisa Donofrio and Kyle Coleman of Être Cosmetic Dermatology and Laser Center and Drs. 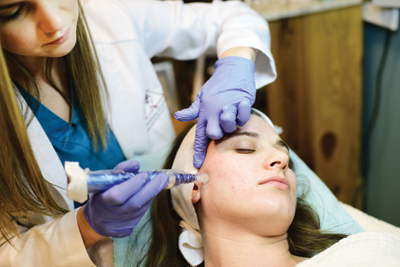 Sarah Jackson and Deirdre Hooper of Audubon Dermatology are, as of press, the only dermatologists in New Orleans offering Silhouette InstaLift, one of the latest procedures in contouring and tightening faces affected by deep lines and wrinkles. Silhouette InstaLift is a simple, minimally invasive cosmetic technique used to improve sagging skin, sagging cheeks and deep lines on the neck, jowls and face by smoothing and tightening the skin of the face to create more youthful features. The procedure literally lifts the underlying tissue without surgery. It involves the use of a dissolving thread that’s placed under the skin that creates lift by its unique bidirectional cone design. The threads fixate the tissue and lead to increased collagen, creating long lasting lift. InstaLift is a single treatment. Depending on the amount of sagging or volume loss, more threads may be used during the procedure to create the desired outcome. The procedure only lasts about 45 minutes and, because it’s so minimally invasive, it’s performed on an outpatient-only basis using local anesthesia. Most patients return to normal activities after treatment. Swimsuit season is also the time when unwanted tattoos, easy to cover up during the winter months, become impossible to camouflage. Dr. Deirdre Hooper of Audubon Dermatology is offering a new state-of-the-art laser system for tattoo removal that reduces both the discomfort and time it takes to remove tattoos and unwanted skin discoloration. Enlighten by Cutera is the world’s first and only dual wavelength and dual pulse duration laser system. “What’s really exciting about picosecond lasers like Enlighten is that they represent the latest advancement in technology and can be used for tattoo removal, benign pigmented lesions and skin revitalization,” Dr. Hooper says. With all the procedures available, is it worth having facials? Do they really make a difference to your skin? Experts at Aesthetic Surgical Associates believe so and recommend their HydraFacial MD at the beginning of summer. In addition to exfoliating dead skin cells and extracting and removing impurities, this facial will replenish vital nutrients including antioxidants, peptides, and hyaluronic acid. This not only gives the skin an “immediate glow,” but the antioxidants will also aid in the prevention of cellular damage caused by the sun. Jaime Shultz, Esthetician at About Face of New Orleans, offers the Four Layer Facial. “It’s perfect for the summer,” Shultz says. “People do a lot of travelling in the summer months, which can really dehydrate the skin, but in addition to providing hydration our facial soothes the skin, which helps after it has been exposed to scorching summer sun. Shultz also reminds her clients that changing out their winter products for some smart summer choices will go a long way in keeping their skin healthy and at its best. “Your skin needs are going to be different when the temperature and the humidity are both in the 100s. Make sure you have a gentle exfoliant in your make-up bag, such as GloTherapeutics Refresh Polish. This product will eliminate dead skin cells and help keep the pores unclogged. The Glo Therapeutics line is also available at Belladonna Day Spa where estheticians like Colorescience’s tinted moisturizers with SPF 30+, which is available in four shades. Belladonna is also carrying a line that people are calling “a Southern beauty miracle:” Mississippi Miracle Clay, a brand of hydrating and nourishing products. The facial oil cleanser dissolves bacteria, dead skin, dirt and make-up, replacing it with fresh and clean plant-based oils and minerals. The all-natural alcohol-free mineral toner, which uses a gentle blend of cooling rose hydrosol, calming chamomile hydrosol, witch hazel hydrosol and alpha hydroxy, can even be kept in your purse and used as a refreshing mist on hot days. New Orleans may be one of the hottest, most humid places in the country this time of year but with all the experts and bottled expertise at our fingertips, there’s no reason to look anything less than a Southern belle. Note: St. Charles Avenue magazine doesn’t advocate plastic surgery except under certain conditions. Please consult your doctor before undertaking any medical procedure.